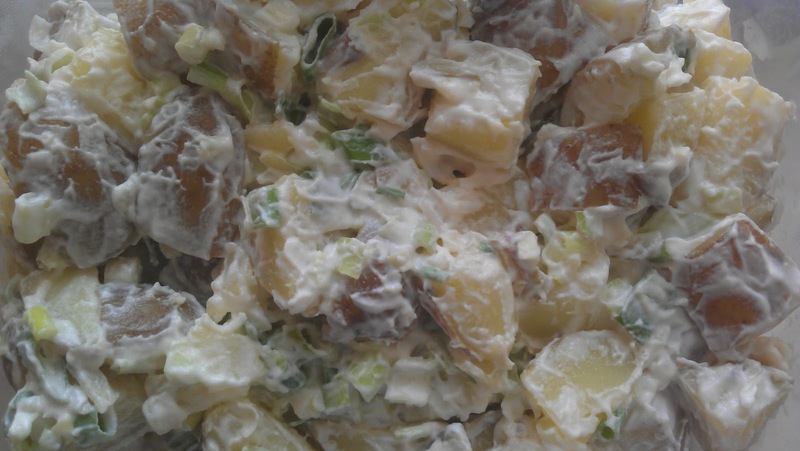 Potato salad is one of those really satisfying comfort foods. This recipe is adapted from my late German stepmother's recipe, using spring onions instead of white onions. I dedicate this recipe to my dear friend and colleague Julie C, who loves it. Boil the potatoes whole in salted water until cooked through. Drain and allow to cool. I no longer peel potatoes, except for making mashed and roast potatoes, but you can peel them after boiling if you so wish. Cut the potatoes into bite sized pieces and place them in a large bowl with all remaining ingredients. Mix well and press the potato salad into a storage container. Allow it to chill in the fridge overnight for the flavour to develop before serving. Perfect with boiled German and Polish sausages, or as a side for BBQ meats.